Every Sunday at 10am we gather together as a church. When we come together on Sunday our hope and prayer is that it is a time of encounter – encounter with God and also with each other. We believe that when we meet in His name, He is there with us and wants to meet with us. We recognise that this will be different for different people as we are a very diverse group …. but this is to be celebrated and enjoyed. On the third Sunday of the month we hold a 9am service which is more reflective and centred around the communion table. On these Sundays everyone meets up for coffee and fellowship at 10 and the second service starts at 10:30. 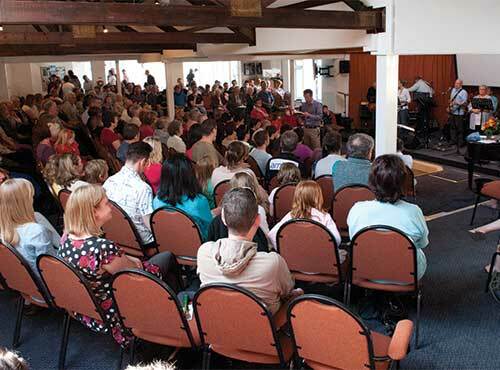 The service starts with everyone together for a time of worship, prayer and sharing family news. Then, usually after about 30 minutes, the children and young people will go to their groups. Our Sunday service usually includes the following parts …. The Bible (and preaching) … each week we read from the Bible and there will be a talk based upon what has been read. Worship … Worship is so much more than what we do on Sunday …. But what we do on Sunday is an important part of our worship. At TBC there are a number of different music groups that lead times of worship each week. Prayer … There are times during the service when we pray for one another, our community and our world. After the service people are usually available to pray for others if there is a specific area that people would like prayer for. Hearing from God … we believe that we can hear from God and that there are times when he speaks through his people, and there is space for this. Being together … After the service there is space and time for people to meet together and chat over a coffee. We also have occasional lunches after the service. Communion … This is an opportunity to celebrate the life, death and resurrection of Christ. We celebrate communion once a month in the morning and this is open to anyone who believes in Christ. Baptism … At TBC we believe that a key way of celebrating faith in Christ in our lives is through Baptism. We do this either in the church or down at the beach.